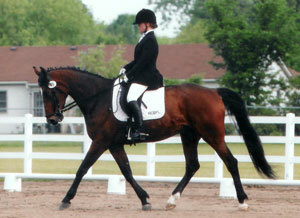 June 2004 Tracy and Rho were chosen to be the 3rd Level demo riders for USDF Adult clinic series with Walter Zettl. 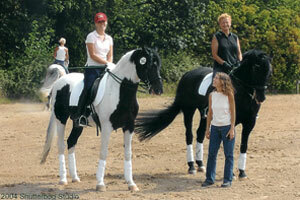 It was a wonderful experience of a lifetime with a kind and correct Dressage Instructor. 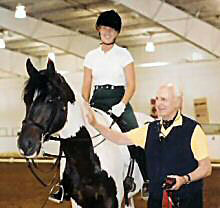 October 2003 clinic with Karl Mikolka a true Master of dressage training. 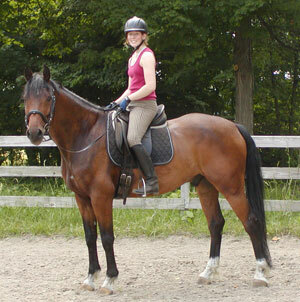 Mr. Mikolka nicknamed Rhoquest "the little indian pony" fondly. 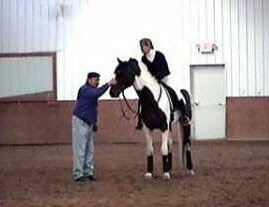 We are really looking forward to more clinics with Mr. Mikolka. 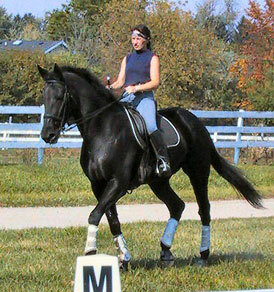 Scout at the 2003 MSU Stallion Expo after six months training with Tracy. 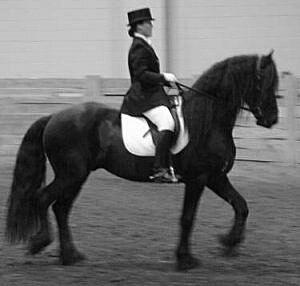 This was an exceptional Friesian Stallion. 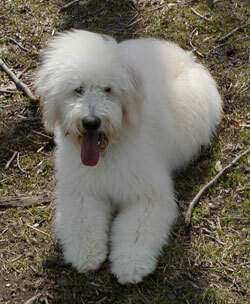 Zac is Sharons Goldendoodle (standard poodle/golden retreiver mix) He is a very fun dog with a great personality! 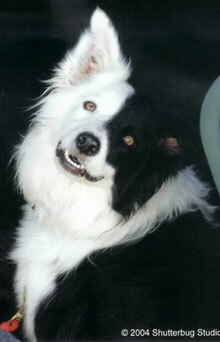 Katie is our "barn dog" she helps us bring in the horses (she thinks! she is really scared of the horses and runs from them! ), and Tracy is her person. 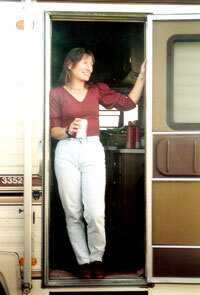 Ruthie relaxing while we camp at a local recognized show. Ruthie and Vicki who is an off the track TB mare now schooling PSG, Ruthie has done all of the training under the watchful eye of Sharon. 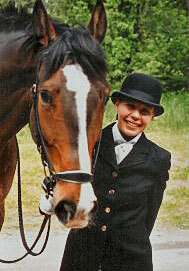 Gretchen Foster has been a part of Rowe Stables for about 45 years! This is her horse Chesapeake who has spent time in training with all the Rowes at various times in her life.. Ches is about 4th level w/ a wonderful passage Sharon just taught her. The Foster family has been a very positive force in the Rowe's business and lifestyle. Kim Dailey has been a student for 20 years and just recently bought a beautiful Arabian gelding from the MSU Auction held yearly. MSU Samaroo aka Sammy is a wonderful, beautiful horse with a good mind. Kim is very lucky to have him we are thrilled with this pair. Ruthie Schultz another 20+ years student was given Matique as a Christmas gift a few years ago. 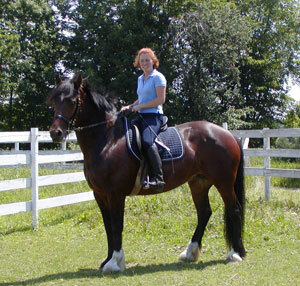 Her brother David a DVM in South Dakota bred and raised this horse. What a wonderful gift! 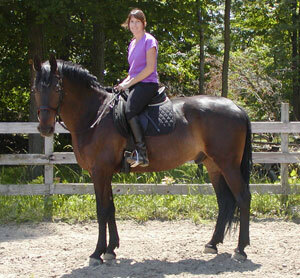 Brandy is a PMU foal and in training with Tracy. 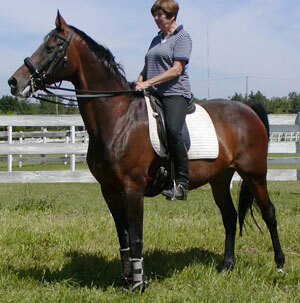 Galileo owned by Mary Ellen is a long term training horse of Tracy's. 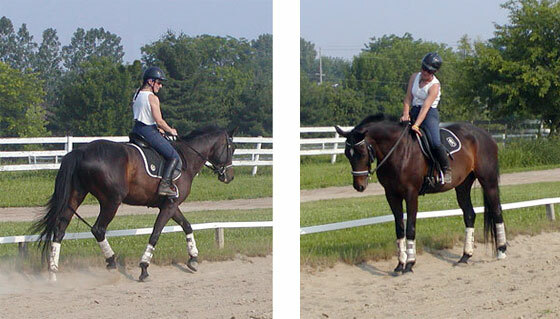 He came as a very nervous horse and is now really doing training. 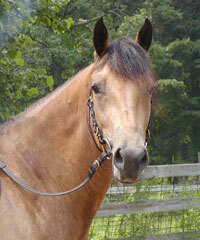 His barn name was Tyler when he came but, he is fondly known as "Sweet Tye" by Tracy. Riatta previously by Lauren Long was purchased from Michigan Sport Horses and is a wonderful horse, he is very talented and we are looking foward to his future. More photos to come. Check back often to see them.